We recently blogged the racketeering conviction of 80 former factory workers in New Jersey. A Federal judge has fined the workers $2.26 million for the filing of fraudulant comp claims. Now the state is examining the ramifications of the judgment, which exposes an enormous fault line between state and federal law. Here’s the problem. The racketeering conviction paints all the workers with one broad brush. The federal court, seeing a disturbing pattern in the 80 identical claims that were filed, has determined that all the claims are fraudulant. That means that any claims accepted by the state workers comp system immediately become a liability under the federal judgment. The value of the claim is tripled and added to the default judgment. For example, if the state system awards a worker $300 per week indemnity and covers medical bills for treatment, that same worker owes $900 per week indemnity plus triple the cost of the medical treatment under the federal case. Ironically, the workers are (financially) better off if their claims are denied. A Catch-22 if there ever was one. Tne New Jersey labor commissioner has asked the Attorney General’s office to look into the situation. The AG should brush up on the Federalist papers. Unless the state convinces the feds to back off from their blanket judgment, the workers will remain in a grotesque limbo. Those with legitimate injuries will not only lose access to the comp benefits they are entitled to, they are still liable for a judgment that exceeds their annual incomes. There is little question that the mass filing of identical claims involved fraud. The law firm involved has already settled. The guys in suits just walk away, as usual, leaving the burden on the backs of the workers – mostly hispanic women, many of whom do not speak English. Sure, they signed the false papers, but did they have any idea what they were signing? They have to accept some form of responsibility. But it is a painful irony that the handful of workers with legitimate, work-related claims are the ones most at risk. It is probably far fetched to assume a solution such as this: any worker who thinks he or she has a real injury undergoes an independent medical exam. If the exam finds a work-related condition, the case is separated out from the federal judgment. The worker collects comp benefits. If there are no objective findings, or if the former employee decides not to file a claim, the worker is stuck with the (unpayable) fine. It’s not perfect, but it would be a lot fairer than the current nightmare, which tars all of these workers with the same very broad and very ugly brush. Richard Eskow has posted a fresh version of Cavalcade of Risk at Sentinel Effect – it’s a particularly good issue. And as usual, we use our visit as a chance to explore the host blog in greater depth – and we can see that Richard’s blog is on we should be visiting more frequently. A sampling of recent posts include commentary on the emerging trend to onsite health clinics and how patients’ minds may be the forgotten medical device. He also points us to the Iowa Health Prediction Markets, an interesting approach to predicting pandemics, flu outbreaks, and other public health concerns. Good stuff! Every now and then ,we come across a historical site that catches our interest, either because it highlights an industry, a telling event, or some other matter related to work, insurance, or the matters that we tend to discuss here at Workers Comp Insider. Mining’s Legacy – a Scar on Kansas is just such a site. Hosted by the Lawrence Journal-World, the site uses text, video, photography and historical documents to tell the story of the mining industry in Cherokee and Crawford counties. The series chronicles the long-term impact that the industry has had on the landscape and the people of the area. While the entire site is of interest, both for the historical and the contemporary significance, we found the worker stories to be quite compelling. “It was a bad way to make a living,” says 81 year-old Walter Weinstein, who went to work in the mines at the age of 12. He narrates a slide show that gives a good idea of the working conditions in the mines. It’s an interesting story, and one that will probably offer some perspective on any job annoyances you may have today. A posting on discussion site Metafilter offers more colorful historical context around the industry, the era, and the geographic region. The Department of Labor also has a fascinating historical mining exhibit on the Mine Safety and Administration Administration pages, encompassing topics such as the so-called breaker boys, children as young as 8 years old who worked the mines, “Eight Days in a Burning Mine”, the harrowing story of a survivor of the Cherry mine disaster, and pages focusing on the history of Irish, Asian, and Afro-American mine workers. Unfortunately, unsafe conditions are not just a matter of historical record. While safety has improved, mining continues to be among the world’s most dangerous professions, both here in the U.S., and in various points throughout the globe. Last year, U.S. coal mine deaths spiked to a 10-year high. Two weeks ago, we had our first U.S. miner death in 2007, and this week, at least 107 miners lost their lives in underground Siberian tunnels and in China, where at least 5,000 die in mining accidents each year, 15 workers perished in a flood and another 26 died in an unrelated explosion. When – and Where – Does the Workday Begin? Irene Muszynski is a teacher in Buffalo NY’s Grover Cleveland School. Last October, she parked her car on a side street a half block from the school – the school’s small lot cannot accommodate all the teachers. As she reached into the back seat of her car to retrieve some materials, Terrance Johnson, a 17 year old student at the school, clobbered her with a board and continued to hit her as she fled up the street. He finally left her lying on the ground, bleeding, and drove off in her car. – The attack was not work-related because there is no evidence that Johnson assaulted her because she is a teacher. While there is often a lot of ambiguity when “public” thoroughfares are involved in determining compensability, I think the judge got most of this decision wrong. If Muszynski had been assaulted in the school’s small parking lot, she would have had a compensable claim. She would have been “at work.” The judge fails to note that the parking lot was not an option for the teacher – the lot was already filled. So it is no great stretch to assume that the parameters of coverage extend beyond the inaccessible lot, down the public street to the spot where Muszynski actually parked. I would argue that she was “at work” as soon as she stopped the engine of her car. The judge is correct, however, in stating that the attack was not related to her work as a teacher. Johnson was a student and Muszynski was a teacher, but the assault was not based upon these specific roles. Johnson acted as a thug, not as a student, and Muszynski was a random victim, not someone functioning as a teacher. As a result, she is unlikely to have access to the provision in the Buffalo teachers’s contract that makes a teacher injured in a “school-related” assault eligible for full pay for up to five years, as long as the teacher is medically unable to work. Physically, Muszynski appears ready to return to work. Here’s a suggestion that won’t cost the school administration a dime, yet will help speed Muszynski’s return to to the classroom. Give her an assigned space in the little parking lot attached to the school. The union would probably find this small accommodation acceptable. And it would take away at least some of the anxiety in coming back to work. Right now the situation is not doing anyone any good: Muszynski cannot teach and the schools are down one teacher. Instead of getting lost in the fog of compensability, let’s focus on the essentials and get Muszynski back to work. Posted in Disability | Comments Off on When – and Where – Does the Workday Begin? I was in an Asian restaurant last week, enjoying a meal with my extended family. At a nearby table, I noticed a dad with two young children, a boy about 6 and a girl about 4. The boy was leaning against his dad and gazing at the ground; the girl stared listlessly into space. Dad was scrolling through his emails on a Blackberry. I took in the scene briefly. When I glanced back, fifteen minutes later, the kids were still bored and restless and dad was still sorting through his electronic messages. Not a word had been spoken. In his mind, I suppose, dad was multitasking work and fatherhood. He was kidding himself. His real focus was on his work (or who knows, maybe his girlfriend); he was sitting at the table, but he had literally abandoned his kids. Steve Lohr writes in the New York Times that multitasking is beginning to look like a delusion. There is emerging science that shows the brain is really unable to handle parallel tracks. We think we can manage more than one task at a time, but we are almost always switching back and forth. The brain shifts from one locus to the other. What’s lost is concentration and focus. We’re not everywhere at once. We are nowhere. We have blogged the dangers of multitasking: specifically, the risks involved in the use of cellphones while driving. Beyond the safety issue, there is a significant issue of productivity. We think we can listen to music, respond to phone calls and emails, talk, think, write and get done what needs to be done. In fact, once distracted, it can take a long time to get our focus back. A study by Jonathan Spira at Basex estimates that 28 per cent of our time is spent on “interruptions and recovery” before returning to the main task. Another study, involving Microsoft employees, showed that after responding to incoming emails or instant messages, it took, on average, 15 minutes to return to serious mental tasks, like writing reports or computer code. Employees took time to reply (to presumably less important matters) and then often shifted into browser mode, checking out the latest news, sports or entertainment Web sites. The scientists – generally people with a formidable ability to focus – have a few recommendations for the rest of us. – Listen to soothing background music if you must, but avoid music with lyrics, instant messaging or TV shows on your Ipod. The real challenge is to learn how to manage the ingenious technology that surrounds us, as opposed to allowing that technology to manage us. Sure, it’s great to be connected to everyone and everything at every moment. But these connections are meaningless when compared to the miracle of a simple moment in the company of colleagues, family and friends – in the presence, perhaps, of our children, who look into our eyes with the expectation and hope that they have our undivided attention. Earlier this week, the U.S. Chemical Safety Board (CSB) released a scathing report based on investigations into the BP disaster that killed 15 people and injured at least 180 others two years ago today. The report found fault with BP, citing organizational and safety deficiencies at all levels of the BP Corporation as well as “material deficiencies” in the safety of BP’s five U.S. refineries in Texas, California, Indiana, Ohio, and Washington. Cost-cutting, downsizing, lack of adequate process controls, and fatigue by workers who had worked for 12-hour shifts for 29 consecutive days were all cited as contributing factors. Deficiencies were known by supervisors who bypassed Process Safety Management Standards, signing off on equipment checks that were never done. CSB also investigated the safety culture, finding a dysfunctional safety culture permeating the organization and a series of recurring safety problems that had been previously identified in internal audits, reports, and investigations leading up to the accident. “OSHA oversight is “constantly shooting behind the duck, that is, after the accident occurs, OSHA then comes in. There seems to be little pre-emptive investigation,” Bowman said. After Bowman’s panel investigated, OSHA’s own probe found more than 300 serious violations of its standards at the refinery, he said. We note with interest that many of these calls for reform are coming from the the Education and Labor Committee, and we think we detect the influence of our erstwhile fellow blogger Jordan Barab who turned in his keyboard to work at that Committee. Jordan’s Confined Space archives on the BP disaster are perhaps one of the best online chronicles of events. Tragedies are often the catalyst for change and this may mark a turning point in OSHA’s laissez fair attitude of recent years. Every other Thursday, the health policy people get restless and issue a fresh heaping of health wonkery. Today’s the day – Health Wonk Review #28 is freshly posted at The Health Care Blog. And you can always catch up on any back issues if you have fallen behind. In reviewing today’s entries, we note a promising new participating blog, e-CareManagement, which focuses on chronic disease management, technology, strategy, issues and trends. And as usual, it’s well worth spending some time to get to know the hosting blog. Matthew Holt’s The Health Care Blog is highly regarded in the health wonkisphere, and with Joe Paduda, is one of the founding members of Health Wonk Review. When a plant closes, the bond between employer and employee is broken. We often find that long-term employees, stung by the loss of jobs, file workers comp claims. Given the cumulative trauma of industrial work, the claims are often supported by objective medical evidence. With no opportunity to accommodate injuries through modified duty, the employer is stuck with the bills, which can be substantial. Most employers throw up their hands and write off the claims as an uncontrollable cost of doing business. Which brings us to the case of Melard Manufacturing in Passaic, New Jersey, cogently outlined by Greg Saitz in the New Jersey Star Ledger. Melard, a manufacturer of bathroom fixtures, closed in 2002, laying off the entire workforce of 111 people. Enter Michael Policastro, an attorney at the time for Ginarte O’Dwyer Winograd and Laracuente (the website speaks for itself). Policastro aggressively recruited the laid off employees and filed workers comp claims on their behalf. Policastro must have been pretty convincing, as more than 80 of the workers filed claims. Unfortunately, Policastro was more focused on quantity than quality. Most of the claims were identical except for the personal identifying information. The law firm apparently directed employees to provide false information to doctors. Subsequent exams by company doctors found virtually no disability attributable to work. In 2004 Bath Unlimited, the successor company to Melard, sued the law firm and the employees in federal court under the RICO statute. By this time, Policastro had left the law firm. Gilante was represented by Alan Zegas. Zegas claims that “the Ginarte firm did whatever was in its power to do to protect the workers.” Which turns out to be absolutely nothing. The law firm settled out of court, leaving the 84 workers on their own. Judge Chesler ruled in favor of Bath Unlimited, signing a default judgment of $2.2 million against the former employees. These are people who made less than $20,000 a year, working in an aging plant under difficult (if not substandard) working conditions. That comes down to $26,000 per employee (more than any of them made in a given year). One of the many fascinating aspects of this case is the basis for the $2.2 million fine. Included in the calculation are at least two compensable claims, totaling about $36,000. Under federal rules, the judge tripled these amounts and added attorney costs. Thus a federal judge rules the awarding of benefits to be fraudulent, even though a state judge found that at least one of the claims, involving lung damage, was related to the working environment. The lingering issue is one of jurisdiction. The New Jersey workers comp system continues to handle the claims, one at a time. In at least two cases so far, they have concluded that the former employees suffered compensable injuries. The broad net of fraud cast over all 84 employees has apparently included at least a few legitimate claims. Will the judge continue to add the compensable claims to the fines? Will he hold the employees in contempt if they cannot come up with the big bucks? Does Bath Unlimited really want to see these people locked up? We hope that employees who experience a plant closing find better legal advice than that offered to the Melard workers. We also hope that employers contemplating a plant closing take affirmative steps to transition their employees, first and foremost by providing job search assistance. If comp claims are filed at the time of the closing or soon after, they should be managed aggressively and humanely: the legitimate, work-related injuries should be paid; the fraudulent claims should be denied. The broad brush of the RICO statute is almost never needed and should be an absolute last resort. Business necessity sometimes requires the closing of a plant. But managers should never lose sight of the contributions made by a committed workforce. Shut the door if you must, but try not to slam it in the faces of your people. The Sole Proprietor Conundrum: Compulsary or Optional Comp? Delaware has finally fixed its comp statute, lowering rates by limiting attorney fees and by establishing a medical fee schedule. They’ve also implemented a pay without prejudice period, under which carriers must begin paying benefits promptly, while reserving the right to stop payments at a later date if compensability comes into question. That’s all well and good. The Delaware reforms have given rise to an interesting policy issue: the revised statute not only invites sole proprietors into the comp system, it requires them to secure coverage. Many states exclude sole proprietors from coverage; some make the coverage optional. Delaware is the first state I am aware of that makes the coverage mandatory. There’s been a very strong push back from sole proprietors, who say they cannot affort the premiums. The state’s Department of Labor is waffling on implementing the new standard and is looking to the legislature for guidance. I think Delaware should stick to its guns. Here’s why. Independent contractors and sole proprietors have evolved into the biggest loophole in the comp system, big enough to drive through with the proverbial Mack truck. There are literally hundreds of thousands of construction workers across the country who labor under sub-standard conditions without any insurance or benefits. The general contractor calls them “independent,” even though he directs the work. A home springs up on the vacant lot. Who built it? “Independent contractors.” Who had insurance? No one. Why? Because it’s a lot cheaper to build that way. Is it a crime? It’s insurance fraud. Premium avoidance is a type of fraud far more prevalent than the rare “faked” injury. Why does it matter? Because legitimately insured businesses cannot match the low pricing of their uninsured competitors. And we all end up paying for the serious injuries of uninsured workers. It’s Broken, But Can You Fix It? Massachusetts has struggled mightily to capture premium for independent contractors. The state has taken action to redefine independence. In MA law, the presumption is that everyone works for someone, unless you can prove otherwise. The standard for “independence” is so high, most uninsured sub-contractors cannot meet it. (Read the Attorney General’s advisory here.) As a result, the payroll of most subcontractors without proof of coverage is now routinely added to the payroll of the GC, resulting, of course, in higher premiums. In other words, the sole proprietor can still “opt out” – but in many instances the GC ends up with the bill. There are a couple of flaws in the MA enforcement effort. First and foremost, abuse is so widespread, the state cannot find every uninsured contractor. In addition, because comp coverage for sole proprietors remains optional, enforcement is limited to finding the responsible GC. As a result, the independent contractor loophole has been significantly narrowed, but you can still drive a VW bug through it. That’s why Delaware should implement mandatory coverage. It’s risky – and the pressure to back off will continue to be intense. But it’s the right thing to do. Once you make workers comp coverage mandatory for everyone, you truly level the playing field and you ensure that all workers are protected. To be sure, the cost of doing business for the sole proprietor goes up. But at the same time, the cost for everyone else goes down. And you have the confidence in knowing that everyone is finally protected. Long the poster child for a comp system out of control, Delaware has an opportunity to lead the way for everyone else. It will be interesting to see if they have the political will to get the job done. Insurance Information Institute – Bob Hartwig is one of the nation’s most knowledgeable workers’ comp experts – we can’t believe we didn’t have this essential resource in our sidebar yet! Ergonomics in the News – is a news blog by Usernomics featuring articles for workplace ergonomics, safety, and biometrics. In addition to sourcing some really useful articles like the one on kitchen foot protection, they also keep us up on some cool and futuristic technology innovations and tools. The Naval Safety Center Photo of the Week features a new photo each week highlighting a frighteningly unsafe work practice. We’ve linked to it before, but we will be adding it to our sidebar. Gruntled Employees is a blog by attorney Jay Shepherd. 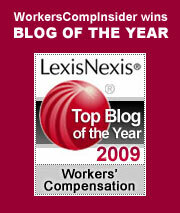 The blog’s premise is that “Managers, executives, in-house counsel, and HR people know all about disgruntled employees. They cost employers billions of dollars each year in lawsuits, attorneys’ fees, lost productivity, and wasted time. Here we discuss how to keep employees gruntled. We also talk about dealing with your lawyers.” Here at Workers’ Comp Insider, we’re all for gruntled employees! Google Blog Search is Google’s blog-specific search engine, helpful if you want to track news on just the blogs. In a bit of housekeeping, we moved Confined Space archives to our Safety Resources. It won’t be updated regularly, but the archives are very valuable. We hope our friend Jordan Barab is making progress in DC! On the safety front, we would also remind you to visit Weekly Toll. We also note the address change for Brent Hunsberger’s At Work blog from OregonianLive.